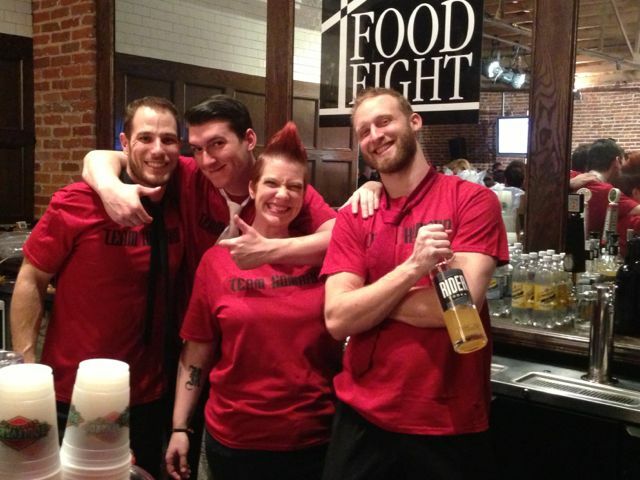 Chefs are a competitive lot, but it was all friendly competition at last week’s CCVI Food Fight 4. 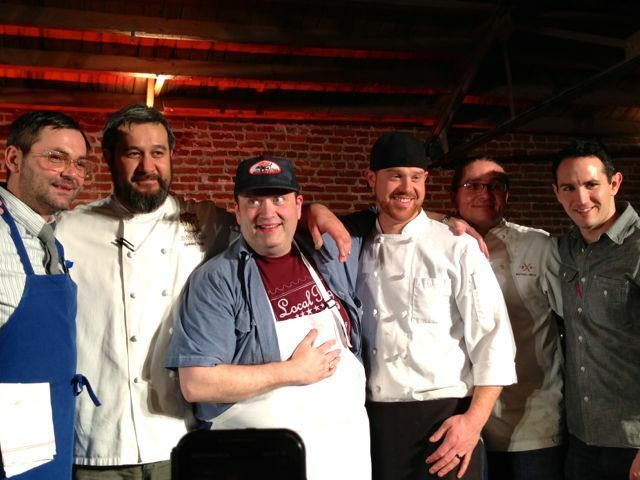 Three of the city’s best gathered on stage at The Guild, cooking to beat the clock, impress a panel of judges and benefit the Children’s Center for the Visually Impaired. 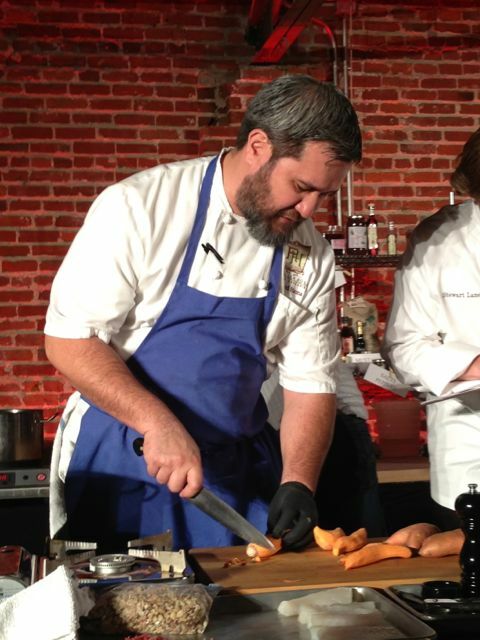 Alex Pope of Local Pig topped the event, closely followed by Howard Hanna of The Rieger Hotel Grill & Exchange and Michael Smith of Michael Smith and Extra Virgin in what co-chair Dolly Wood called the tightest point-spread in the event’s four-year history. This year’s twist? Help from a trio of untrained sous chefs. Jerry Fisher, a self-described food enthusiast who’s never worked in a professional kitchen, backed up Pope. Hanna’s second was Tony Glamcevski, an industry pro who’s worked at Le Fou Frog and Green Dirt Farm and is now front-of-house at The Rieger. 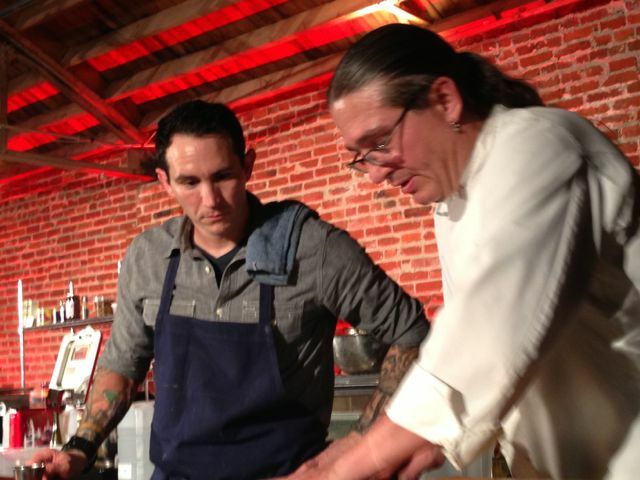 And Ryan Sciara of Cellar Rat Wine Merchants served as Smith’s sous. If it added tension to the evening, you couldn’t tell. Each duo focused on the job at hand, chopping, frying and roasting as efficiently as possible in their make-shift kitchens. Their task: to prepare three courses in one hour, using ingredients from a grocery bag that included cod, flank steak, black walnuts, piquillo peppers and the like. They could plan everything in advance but for one factor: a secret ingredient announced by honorary chef and chairman David Crum at the outset of the evening. His pick? Sweet potatoes grown by Thane Palmberg. They certainly were. A volunteer circled the room with a basket of fresh sweet potato chips that were so crisp and sweet that I was tempted to follow him until the basket was empty. Not that there weren’t plenty of other options. Kansas City’s restaurants support this event with abundant generosity and tables full of tasting portions. Sponsors included Aces Cake Shop, The American Restaurant, BabyCakes, Café Sebastienne, Extra Virgin, Lon Lane’s Inspired Occasions, The Jacobson, Local Pig, Natasha’s Mulberry & Mott, Remedy Food & Drink, Reserve, The Rieger Hotel Grill & Exchange, The Roasterie, Room 39, Snow & Co. and Starker’s Restaurant. Still more sponsors donated funds, wine and silent and live auction items. Guests even got to vote for their favorite, and Lon Lane’s Inspired Occasions won the People’s Choice award for at least the second year in a row. And then there was the bar. Boulevard Brewery supplied beer, including its far-too-quickly tapped out Rye-on-Rye. Dark Horse Distillery and Moonlight Liquors provided ample spirits that four of the town’s finest bartenders crafted into cocktails. Jake Cole of Port Fonda created a Michelada (Port Fonda’s hot sauce, maggi, Tecate beer, salt and lime), while Travis Stewart, Port Fonda’s bar manager, served up his Siberian Punch (Samogon Russian grappa, Kronan Swedish Punsch, Ceylon fruit tea, an oleo saccharum made with lemons and sugar and nutmeg). Brock Schulte, who manages The Drum Room’s bar, offered Long Shot Limeade (Dark Horse’s Long Shot White Whisky with cherry limeade). And the always amazing Jenn Tosatto, bar manager at The Rieger, created the Night Rider (Dark Horse Rider Vodka with lemon, honey cider syrup and soda water). Still, no one had more fun than the judges, who sampled all the dishes and ultimately named Pope winner. 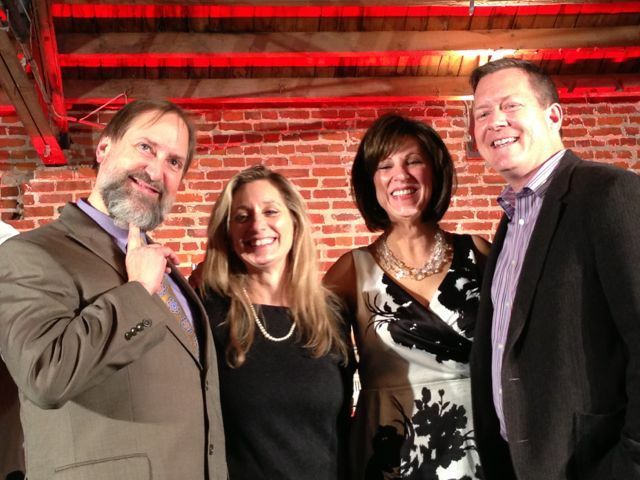 The panel included Debbie Gold, executive chef of The American Restaurant and winner of Food Fight 1 in 2010; Doug Frost, Master Sommelier, Master of Wine, host of KCPT’s Check, Please Kansas City and all-around drinks guru; Katie Van Luchene, executive editor of Kansas City Magazine; and Kevin Marsh, a food enthusiast known for his Facebook catalog of vibrant food photos who for the second year in a row bought his judging rights at auction. Pope began with a seared beef tartar garnished with a sweet potato chip, a dish Frost described as a “delicious mess.” He followed with braised cod with salami, sweet potatoes and a vadouvan sauce. Yeah, I had to ask what that was, too. Pope described it as a French curry sauce, made by first sweating finely chopped onions, garlic and shallots and then mixing them with freshly toasted and ground fenugreek, cumin, coriander and other spices. It’s all then roasted again until it turns into a sweetly spicy, sticky paste. The result was what Marsh called nicely curried without being too curry-forward. Pope’s finish was a swirling funnel cake with sweet potato cream cheese, lemon and orange sugar and a sprinkle of sea salt. In other words, “carnival food gone upscale,” said Van Luchene. Howard Hanna (winner of Food Fight 2) kicked off his menu with an Italina crudo-style flank steak tartar brightened with green olives, shallots, lemon juice, olive oil and black walnut pesto. I know the sweet potatoes were in there somewhere, I just couldn’t hear where when he described the dish to judges. It must have worked for them, though, because they praised it as both delicious and lush. Hanna’s main course featured a vodka-battered tempura cod (Hanna said vodka evaporates more quickly than water, thus making for a crispier tempura) with a mini cast iron skillet sidekick containing salami, three types of pepper, sweet potato roasted with garlic and olive oil. For dessert, Hanna served a classic almond financier, nestled in a sweet potato, butter and brown sugar sauce and garnished with amaretto cherries. But the sweetest part? When Hanna gave props to Pope for allowing him to borrow his deep fryer. “He let me fry my fish in his fryer before he did his dessert, so I hope the funnel cake didn’t taste fishy!” Hanna told the audience. Michael Smith’s flair showed through in each of his creations, beginning with a sautéed cod smeared with black garlic. That was garnished with saffron sauce, a relish of pickled ramps and okra and a sprinkle of tiny dice sweet potatoes and accompanied by a quinoa-stuffed piquillo pepper. Next up: a chipotle- and cumin-marinated flank steak, seared and served with a smoked cheese-topped tamale, another unrecognizable sauce (I couldn’t recognize it with all the background noise, anyway—something with sweet potatoes, maybe?) and a sprinkle of baby Swiss chard. Smith, who topped Food Fight 3, finished with a brown butter and walnut flour financier finished with cherry sauce, sweet potato chips and candied black walnuts that were tasty enough to have the judges wishing for more. Just watching it all, I felt my envy that the judges got to taste it all melt into relief that I didn’t have to choose between the chefs. I had the opportunity to do so a couple years ago, and so I know first-hand what a tough job it is. Pope seemed pumped at having won, but the real winners, as always, were the kids who attend CCVI. It’s truly one of the most worthy organizations in Kansas City, and I’m lucky to have been able to support it in such a delicious way. ~ by fooddrinklife on February 18, 2013. Great recap! Thanks so much! 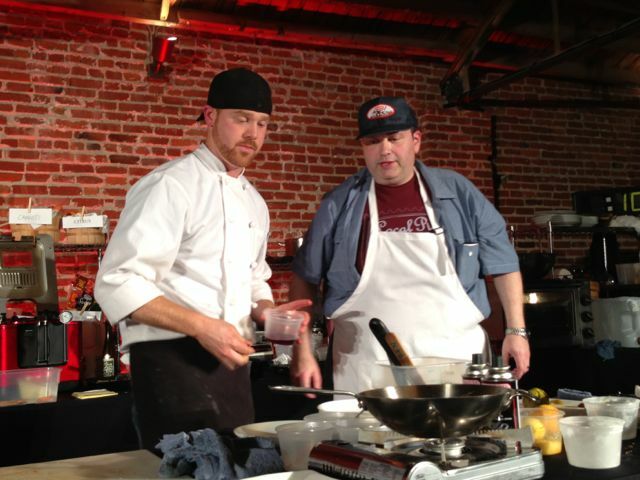 I love seeing the chefs’ creativity under pressure, and all the enthusiastic support for CCVI!